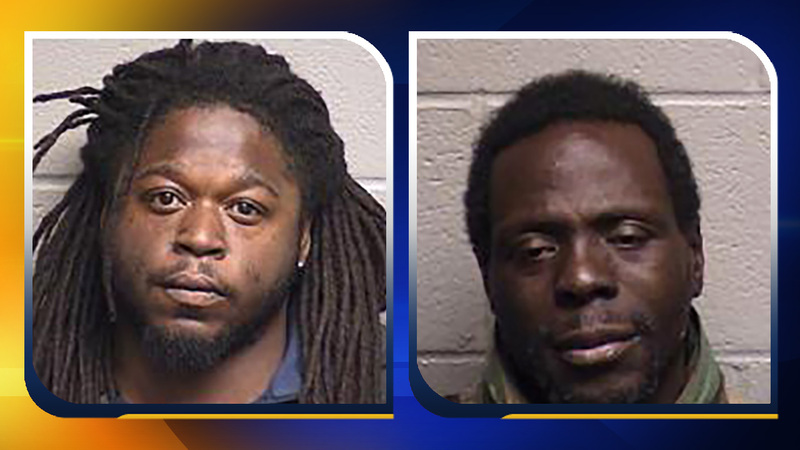 DURHAM, North Carolina (WTVD) -- Two men have been charged with robbing a man at a bus stop near Dillard Street and East Main Street on Thursday night, Durham Police said Monday. Micanthony Jermel McMillian, 28, was arrested Thursday night. Terrell Lamont Brown, 40, was arrested Saturday. The incident happened about 8 p.m. Thursday. A 22-year-old man told officers he was walking on Dillard Street when two men approached him. One man stuck what the victim believed to be a gun in his back and demanded money. As the man was trying to go through the victim's pants pockets, a second man grabbed the victim from behind, choked him and threw him to the ground, police said. He then hit the victim in the face with a large board. The suspects ran off with cash, cigarettes and the victim's wallet. The victim was treated at the scene for his injuries. Officers found McMillian a few minutes later near Holloway Street and Queen Street. McMillian was charged with robbery with a dangerous weapon and felony conspiracy. He was placed in Durham County Jail under a $280,000 bond.